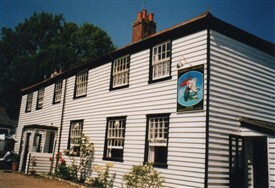 The George and Dragon pub on Foulness Island was originally 3 cottages. It was also the Post Office and village shop, but it has been closed for some time now. There were two other inns on the island, The Rochford Volunteer and The King's Head, but these closed before the George and Dragon. Did you drink at any of these pubs? Did you work there? Please let us know. The George and Dragon closed in 2007. The post office and shop were separate from the pub and continue to function to this day - but not on Sundays. The only time non-residents to the island can get to see Churchend is to visit the Foulness Heritage Centre on specific Sundays and then, if they decide to leave the Centre on foot they must stick to the footpaths. The churchyard is accessible but the church itself is in a dangerous condition and is surrounded by barriers. Just beyond the churchyard is the pub and just after that the post office and shop. Hi Ginette. The pub and church are closed to visitors but the Heritage Centre is open every first Sunday of the month during the summer. Have a look at its opening details and location in the above link. If your cousin cannot make any of the dates you could probably drop a note to the Heritage Centre and ask if someone on the island could make an exception and show her the outside of the pub and/or the centre. 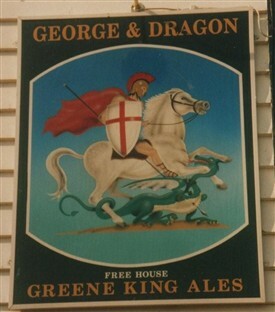 I am the 6xgt granddaughter of James Bennewith, the original licensee of The George & Dragon pub on Foulness. My cousin lives in Perth, Western Australia and will be visiting the UK this summer. She would very much like to visit the pub but has been told that it is not possible. Can you please let me know how I can arrange this for her? Hi Fred and Megan - I've sent you an email with your email addresses included. Thank you for the copy of the book you sent me a while back Fred - its a very interesting book and shows its not plain sailing running a pub, especially taking account the special circumstances you had to deal with on Foulness. Could you give Megan my email address then I can get in touch ? I'm really interested in the history of Foulness. It would be great to get a copy of your book. If you have any left I'd love to buy one. I was the licensee of the George and Dragon for 28 years. I also wrote a book about our life there from 1981-2002. I see on your web page that you are saying the Post Office and Store on the Island is now closed. This could not be further from the truth as from when we moved in 1989 to the Old Stables next to the pub my wife still opened 6 mornings a week making the journey from Shoeburyness each morning. It is open Mon,Tue,Wed,Thurs,Fri 8 am – 2 pm and Sat 8 am – 12 am. If I can be of any other help please get in touch.